While the captain sprinted to Incident Command for instructions from the battalion chief, the rest of them hefted hoses out of the Quint’s bed, removed the pry tools and twisted the heavy steel valves to open the vehicle’s water tanks. The cap faced Francey. “Cordaro, make the forced entry up there. Office is to the left about twenty feet—we’ll look for the guy in there first. I’ll bring in the thermal imaging camera.” He flicked a glance at Dylan. “O’Roarke, take a hose in with her. Roncowsky and Duke, other members of the group who were on the second truck, will follow with a second line.” One driver would stay with the rigs and oversee water delivery. Crouching low, they inched along the wall. Francey groped the floor in front of her. She and Dylan pulled the charged hose down the wide hallway while the rookie and Duke mirrored their actions on the other side. The sound of water slapping on the fire below them indicated Engine Sixteen must have found the seat of the blaze. Reaching around, she found a body slumped on the floor just inside the smoke-filled room, partly blocking their entrance. She eased herself inside and squinted to make out his form. Finally she was able to slit her eyes. Her father hovered over her, his face etched with concern. His dark, just-graying hair was mussed, and his brown eyes were troubled. “Yeah. Alex Templeton was working late at the company warehouse and apparently fell asleep at his desk. When the fire got rolling, he was overcome by the carbon dioxide. You pulled him right out of the jaws of death, sis,” he said with a wiggle of his eyebrows. regal, Diana wore her fairy-princess blond hair swept back from a face devoid of makeup. Even so, she looked a decade younger than fifty. And light-years away from the rest of the Cordaros. “Francesca.” Her breathiness was pronounced. Alex coughed like a three-pack-a-day smoker and shoved away the oxygen mask. He swore as the IV tugged on his arm. “You’ve got to use the oxygen, Alex.” His younger brother Richard’s voice was strained, and his normally pale complexion was chalk-white. He’d never matched Alex’s six-foot-plus height and broad shoulders, but today Richard’s hunched posture made him appear even smaller. And his blue eyes were clouded with anxiety and fatigue. “I will, but I want some answers first. What happened at the warehouse?” Alex coughed again, deep spasms racking his body, shooting pain to his already sore extremities. He fell onto the pillows. The doctors had told him to expect a general malaise, but this exhaustion rivaled his bout with mono when he was a teenager. Alex’s mother, Maureen. Worry seemed to have erased some of the progress he’d made since his heart attack ten months ago. Alex grabbed the mask, took a few deep breaths and lay back. All he could remember about that hellish night was being so tired he put his head down on the desk. He’d awakened in a haze of smoke, stumbled to the door and collapsed against the wood. They said that the small amount of oxygen he’d gotten from being on the floor probably saved his life. The next thing he knew, he was outside on the ground, his eyes stinging, his head pounding like a jackhammer, and his lungs ready to explode. “In the basement.” Richard’s scowl was pronounced. “Not yet,” his father told him. “You don’t have to stay,” Alex murmured sleepily, wondering about the guy who’d pulled him out of the fire. What did you say to a man who’d risked his life for yours? Then he felt soft lips on his forehead and two gentle pats on his arm before sleep claimed him. When Alex woke up, he ate some hospital food and, with the help of an orderly, took a blessedly hot shower. Richard had retrieved pajamas and a robe for him, so when he was dressed, Alex convinced his mother to take his father home to rest. Richard had been harder to send off. The brothers had gotten closer in the past two years. Richard had had a bout with drug abuse when he’d lived in the Midwest. After a painful divorce and some rehab, the only good that had come out of his whole ordeal was that he’d returned home to upstate New York and assumed a management position at Templeton Industries. Though Alex enjoyed playing big brother again, he wanted Richard to get some rest. At last his brother cooperated and left around four. Not much later, another man entered the room. He introduced himself as Fire Marshal Bob Zeleny. 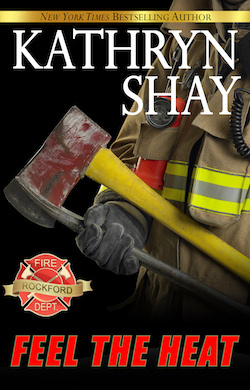 A burly man—the stereotypical image of a firefighter—he was dressed in a suit and tie, not a uniform. The bulge in his jacket told Alex he carried a gun. “How are you feelin’?” Zeleny asked. Alex’s eyes widened at his candor. “We’ll let you know. I’ll be back.” Zeleny headed for the door, coughing again. Hazard of the job, Alex guessed. He rested another hour, then got out of bed, walked slowly down the hall and stood in front of room 435. Fran Cordaro, the nameplate read. He wanted to see for himself that the guy was really all right. And thank him, of course. Alex knocked. No answer. Maybe he was asleep. Edging inside, Alex blinked to adjust to the dim light of the room. Rockford Memorial Hospital had just been refurbished—his family had donated some of the money for the renovations, along with building a new wing—and the decor had been spruced up considerably. Mini-blinds were half-closed against the late-afternoon April sunlight. He could barely make out the muted rose-and-blue-striped wallpaper and accent chair. A figure lay motionless in the narrow bed. From the doorway, the man seemed slight, at least compared to Alex himself. Some firefighters were small, he knew, but they were usually muscular and tough as nails. Quietly, he crossed to the bed. The guy’s back was to him. Something wasn’t right. In the filtered light, he caught sight of the graceful slope of a back and the rounded curve of a hip. Damp dark brown hair came almost to the neckline of the hospital gown. Most firemen he’d seen sported military cuts. A long-fingered hand rested on the pillow. And full breasts stretched the cotton of the gown. Damn, he’d gotten the wrong room. But he could detect a faint acridity of smoke. And the name on the door matched the one his mother had given him. The woman on the bed shifted again, uncovering her face. Alex winced at the swollen purplish bruise near her temple and the long, angry scratches under her chin. Her mouth fell open slightly, accenting the lush poutiness of her lips. She stirred, stretching one arm over her head, arching her back, burrowing her cheek into the pillows. A bit chagrined, Alex crossed to the window and cracked open the blinds, then switched on a corner lamp. Coming back to the bed, he scrutinized her face again, clearer to him in the light. She’d managed to ease herself into a half-sitting position. The nasty bruise was worse from this vantage point; her cheek had swelled too. But it was her eyes that snared him. They were huge, almost translucent and the oddest color, indigo fanning out to deep purple. He’d seen a sky in Saint-Tropez once layered with those hues. “Francesca.” The amusement spread from her eyes to her mouth. He couldn’t stop staring at her face. He didn’t think he’d ever seen such a perfect arrangement of features. Though he’d never thought of himself as sexist—and certainly the existence of female firefighters was not new—the idea was somehow unsettling that this attractive female had rescued him. “I think my ego will survive.” he told her dryly. But the stutter in his heart, the restless stirring of his battered body, indicated that the rest of him might not deal with the incident quite as easily.